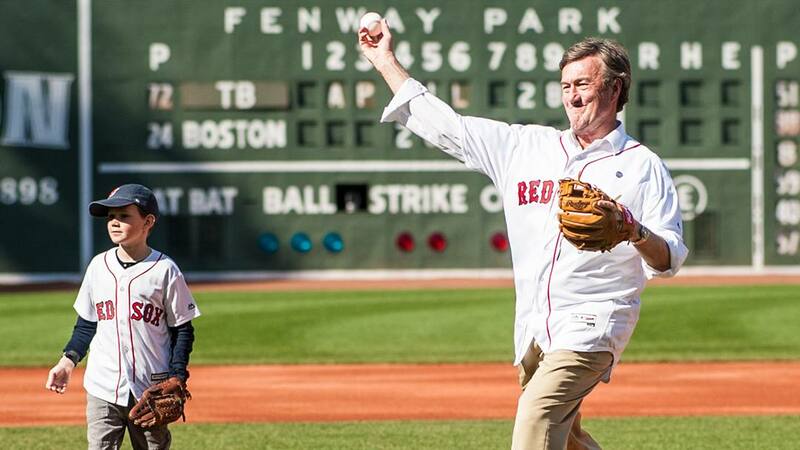 John Noseworthy, M.D., Mayo's president and CEO, throws the ceremonial first pitch at Fenway Park. His grandson, Jack, looks on. Dr. Noseworthy was invited to speak at the Boston College Chief Executive Club. Once word got out that he’d be in town, he got another invitation. 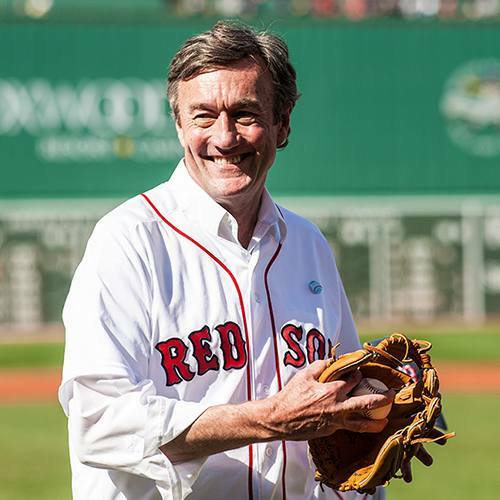 Thoughts of family and childhood heroes traveled with John Noseworthy, M.D., as he approached the pitcher's mound to throw the first pitch at Fenway Park in Boston on Saturday, April 28. "I never imagined anything like this would happen," Dr. Noseworthy, Mayo Clinic's president and CEO, says. "This was a huge thrill, especially to be out on the field with my grandson, Jack. I felt like a little boy." Dr. Noseworthy was in Boston by special invitation. He was a keynote speaker at the Boston College Chief Executive Club on Thursday, April 26, where around 500 executives from various organizations were gathered to discuss trends in their industries. There, Dr. Noseworthy talked about the emergence of innovations in health care. Once word got out that Dr. Noseworthy was speaking in Boston, he received another special invitation — one that made a childhood dream come true. He was invited to throw the ceremonial first pitch at a Boston Red Sox game at Fenway Park. The Red Sox extended the invitation to honor Dr. Noseworthy, a native son, and to honor Mayo Clinic for its national leadership in health care. The Red Sox were playing against the Tampa Bay Rays. The ceremonial first pitch is a long-standing tradition in baseball where a guest of honor is invited to throw the first pitch, marking the end of pregame activities. This was a special moment for Dr. Noseworthy. Born into a Canadian family and raised in the Boston area, Dr. Noseworthy spent many Saturday afternoons listening to Ned Martin, a play-by-by announcer for the Red Sox, call plays through the static on WHDH Radio. Occasionally, Dr. Noseworthy's father would treat him to a trip to Fenway Park, where the pair cheered as Hall of Famer Carl "Yaz" Yastrzemski knocked a few out of the park. Dr. Noseworthy says the best part of throwing the first pitch was being there with his entire family. On his earliest memory of Fenway, Dr. Noseworthy says that he attended his first professional sporting event there when he was seven – the same age his grandson Jack is today. "I had a chance to watch my hero, Ted Williams, play in his final season for the Red Sox," Dr. Noseworthy says. Of course, while taking it all in, he still had to make that pitch. Thankfully, he delivered. "I absolutely did not want to bounce the ball to the catcher, and somehow I managed to throw a pretty good pitch," Dr. Noseworthy says. At the game, Dr. Noseworthy also had the opportunity to hear from Mayo patients. He says he was pleased when several of the fans in the stadium approached him to say how much Mayo Clinic had helped them and their families. "That's here in Boston where they have great medical care," Dr. Noseworthy says. And so far this year, some pretty great baseball.